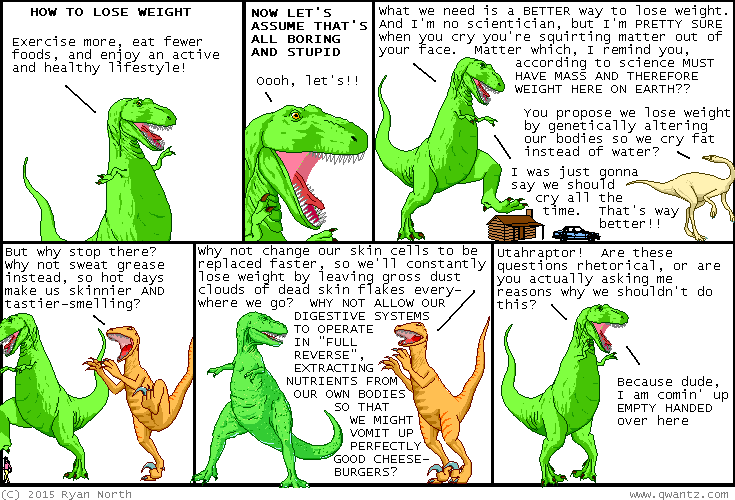 Dinosaur Comics - August 5th, 2015 - awesome fun times! –Don't tell my mom that I'm speaking, of course, of prostitution! August 5th, 2015: This weekend I helped my parents launch a boat, and then they forgot to attach a rope to the boat, so I had to jump into the water fully clothed to swim out to the boat and stop it from crashing into ANOTHER boat!! Then I didn't even get to ride in the boat. TRUE STORY. One year ago today: yes obviously this is leading up to a "world's finest detectives" batman team-up story, why do you ask? ?